GROB continues the successful cooperation with the Viennese trumpeter and composer Franz Hautzinger (GROB 211, 313/4, 425 and 435, for the near future, a release is planned of a quartet with Gene Coleman, Otomo Yoshihide and Sachiko M.). 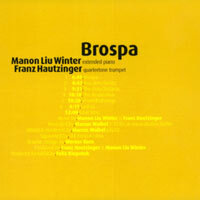 On Brospa, Hautzinger meets the pianist Manon Liu Winter, known from New Music circles. For a while, both have been playing in a duo and have developed their own improvised language. It appears as if Hautzinger is really in his own territory here. Brospa offers no dry, mostly still and radically reduced sound. The murmuring, growling and simmering sounds he elicits from his trumpet and leads into subsonic depths finds a perfect mirror in the varied, equally dense and sophisticated inside playing of Winter. It appears as if the shimmering, cluster-like sounds of both mirror themselves in each other and raise the other to a higher power. Even when the instruments are recognizable as individual voices, one hears – in a higher sense – a synthesis: the music is monochromatic and isn’t as well; it is static and enormously dramatic. It is music that reminds one of the great Romanian sound sculptor Iancu Dumitrescu or on Horatio Radulsecu, but it is – of course!? – improvised, originating in simply one session, originating out of a reflected-spontaneous use of completely simple means. Brospa has become the intensive (nearly in the classical sense!) and voluminous recording (recorded by Marcus Waibel, who is responsible for the sound of the Zeitkratzer Ensemble) that one always expected from Hautzinger and from Winter as well.